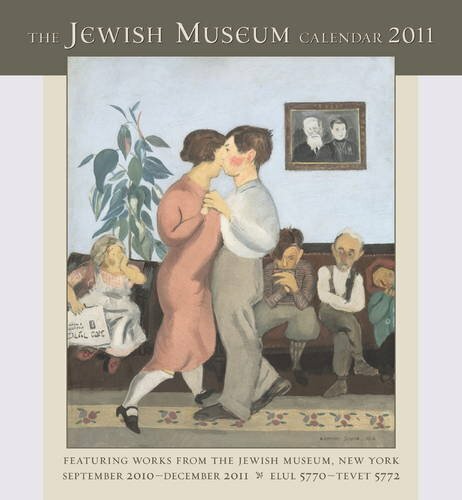 This beautiful calendar features work from the internationally renowned collection of the Jewish Museum, New York. 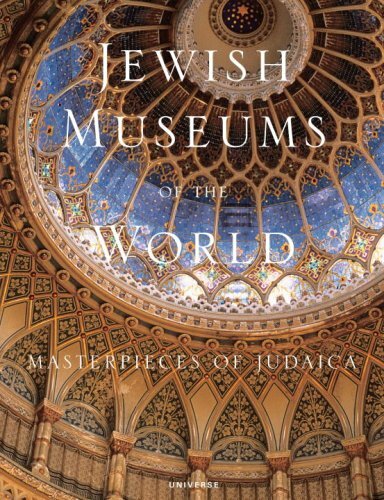 It includes full-color illustrations of Judaic ceremonial masterpieces along with selections from the museum's renowned fine art collection. * The Jewish Calendar 2010-2011, 5771 2011 Engagement Calendar spans a full 16 months from September 2010 through December 2011.
i have been using this engagement calendar for over twenty years and i just love it! it has just enough room for a few entries everyday, and has great photographs. it's always beautiful. I've been ordering this calendar for my use for 0ver 20 years.by now I order multiples to give as Rosh HaShanah gifts.The format is slightly different every year; some years are much better than others.the art work is spectacular. This calendar is nice, but there is no room for other information, ie, phone numbers, passwords to different sites, and other information I would like to have all in one book.It needs some extra pages for personal stuff. Unusual building - yes.Goodbuilding - No.Libeskind has been something of a fad for a while now, but we've seen his stuff and it doesn't rate in the long haul.This gimmicky structure, with all its flaws and dumb theoretical ideas is really no more than a sculptural monument to Libeskind himself.I can think of no better way to dishonor the fallen Jews than this selfish and vulgar building.And when a few more years have passed, it will come to be seen as silly as a Britney Spears pop song. While American Jews are commonly considered a homogenous ethnic group, the reality today is far more complex. Conversion, adoption, intermarriage, and immigration have transformed the fabric of Jewish communities, as they have the United States as a nation. 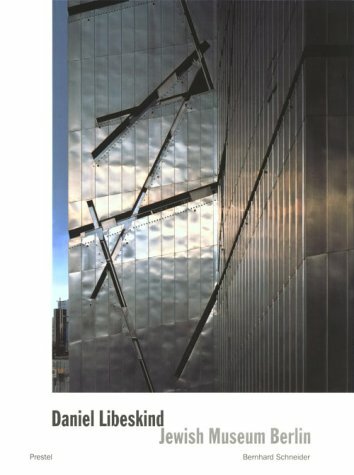 This fascinating book explores questions of American Jewish identity and how Jews fit today into larger discourses of race, ethnicity, and religion. Featuring ten photographic and video projects by emerging and mid-career artists, all commissioned by The Jewish Museum, the book presents a range of provocative discussions of the nature of Jewish identity in 21st-century America. 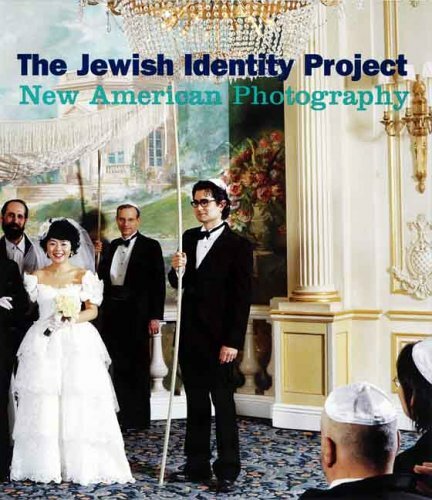 Susan Chevlowe discusses how the artists explore individual communities to dispel stereotypes of contemporary Jewish life, and Ilan Stavans dissects the diversity of American Jews over the last century. In illuminating interviews with the artists, Joanna Lindenbaum provides insights into their ideas and methods. A beautifully illustrated portfolio of each of the commissioned works immerses the viewer in a distinctive community, revealing complex and often surprising ways in which Jewish Americans grapple with their identity. Good representation of the exhibit. A handsome and heavy piece of work with high quality reproductions. 241 pp, illustrated throughout in color. Chronology, Index. 17 pp of End Notes and Bibliography. 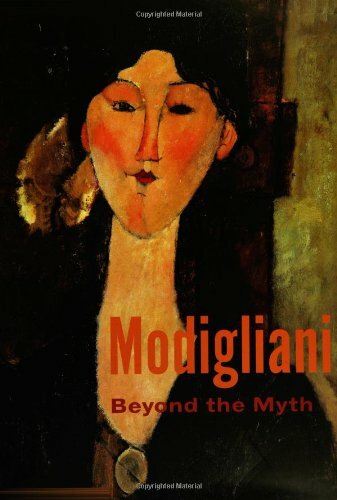 Comprehensive and thorough book about the life and works of Amadeo Modigliani. A great reference book with many plates of his art.I am very glad to have this book, well worth it. I came along Modigilian's Artdruing a drawing class. I purchased a small book at a local bookstore first. I was so impressed over the artist and his paintings that I want to learn more about his work. He is a master painter of the early 20 th century.Some ofhis figures have a sence of sadenessin there way how they look . Some of theposes are oriented on classic old masters.Describtions are given in the book.Also you will see delightfulabstract forms and colors. I really can recomend the book to everyone who wants to learn more about this great artist. The book also shows images of drawings and sculptures. There have been many publications on Modigliani lately and also many exhibitions (in Paris, London, NY). 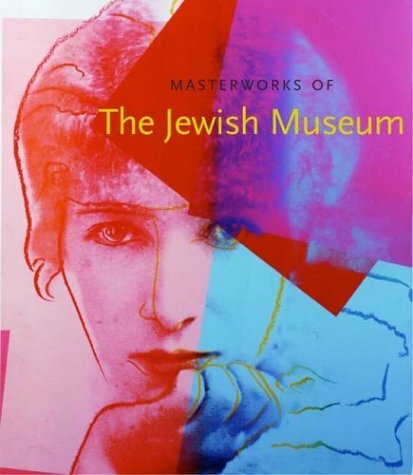 This particular book, which is the catalogue for a show at the Jewish Museum, is, in my opinion, the most original one in that it attempts to study the artist setting aside all the rest (that is "the myth"). The beautiful reproductions enable the reader to see what a revolutionary portraitist Modigliani was, even sometimes minimalist (to use a fashionable word). The provenance of the works shows that he did have early admirers, and not only among his peers or dealers. I bought this book preparing a visit of an exhibition on paintings as well as my paission in arts, i.e. painting. The book is full of pics and enough text about Amadeo. 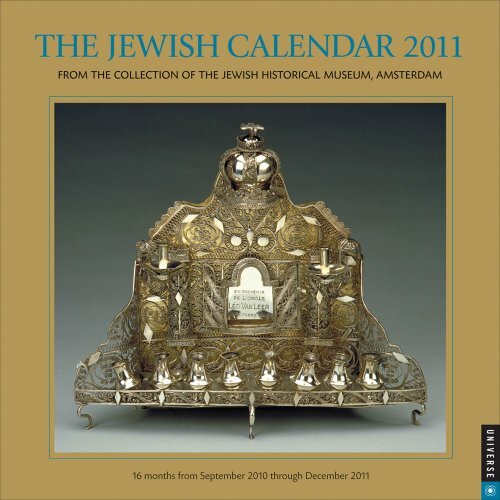 This indispensable Jewish calendar features selections from the superb collection of the Jewish Historical Museum, Amsterdam. 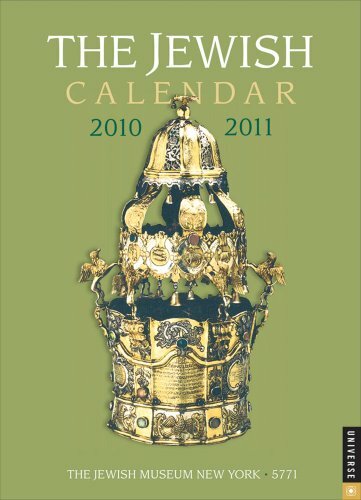 Full-color illustrations of Judaic ceremonial and historical masterpieces are beautifully reproduced in this outstanding wall calendar. Included are U.S. and Jewish holidays, Sabbath candle-lighting times, and a list of Jewish holidays through the year 2016. * The Jewish Year 2011 2011 Wall Calendar spans a full 16 months from September 2010 through December 2011. I've been buying this calendar for years.I definitely preferred the old larger format but I've adjusted.This year they enlarged the date blocks even though the calendar itself is the same as lastyear. The date blocks are now higher than they are wide, rather than square, so there is more room to write stuff. Can't say that I've sampled any other Jewish calendars because this one has and does everything I need.Compared to non-Jewish calendars of which I've seen and used quite a few, this one is at the top of the list.The fall months even have different pictures in different year calendars--e.g., Sept. 2010 in the 2010 calendar has a different illustration than Sept. 2010 in the 2011 edition.It's always hard to decide which edition to use during the Fall. The ceremonial kindling of lights each night during the eight-day holiday of Hanukkah commemorates an ancient victory for religious freedom—the liberation and rededication of the Temple in Jerusalem in 164 BCE. As their diversity and beauty attest, Hanukkah lamps are singularly important as a form of ceremonial art and are among Judaism’s best-loved traditional objects. 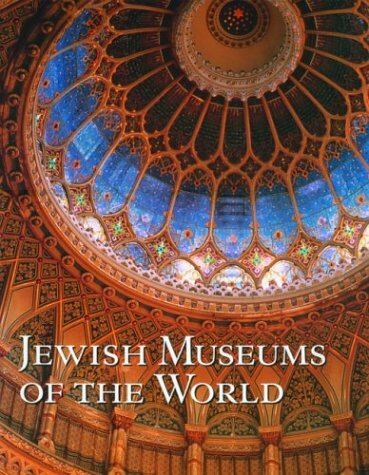 This superbly illustrated book showcases more than 100 Hanukkah lamps selected from the extensive collection of The Jewish Museum in New York. The featured lamps date from the Renaissance to our own time, and were created from a wide variety of materials in virtually every part of the world, including the Americas, Europe, Asia, the Middle East, and North Africa. 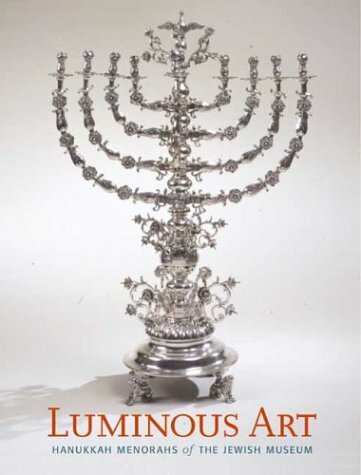 Susan L. Braunstein provides an engaging overview of the Hanukkah lamp and discusses its origins in Jewish tradition, its many innovative forms, its enduring ritual uses, and its social context. She also includes a short informative essay about each of the wonderfully varied lamps pictured in the book. 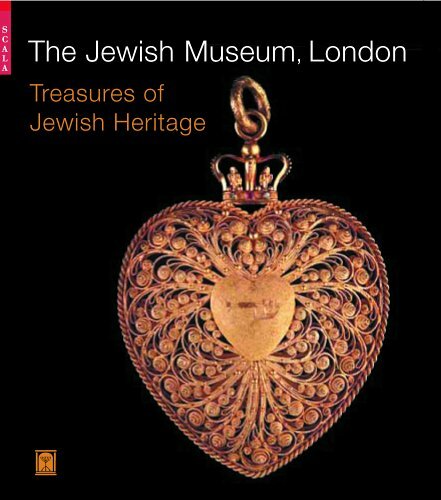 Susan L. Braunstein is curator of archaeology and Judaica and head of the Judaica Department at The Jewish Museum in New York. She is also adjunct instructor of Jewish art and material culture at the Jewish Theological Seminary of America. She is coeditor of Getting Comfortable in New York: The American Jewish Home, 1880–1951 and coauthor of Israel in Antiquity: From David to Herod. A lovely coffee-table book. Weighs a ton! While the pictures are beautiful, there are surpringly few of them. Even the text is scantier than might be expected -- the type is very large! What's there is fine -- but for the price I might have expected more. 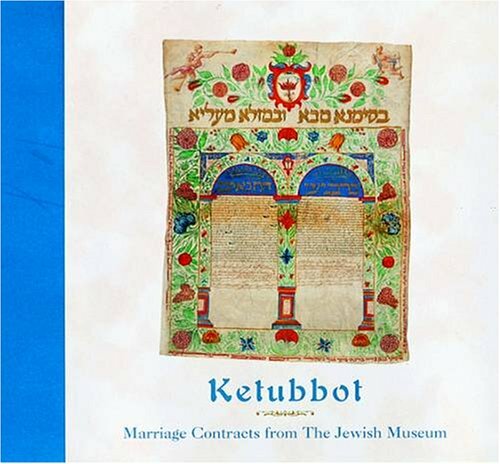 The extraordinary paintings, prints, textiles, and ceremonial objects reproduced in this sixteen-month calendar reveal different aspects of Jewish culture. Spanning several continents and nearly three centuries, these works, from the Jewish Museum in New York City, speak powerfully about the Jewish experience in the world. In addition to its sixteen striking images (one for each month), the calendar includes major and minor Jewish holidays, lists the weekly Torah readings and candlelighting times, and gives the blessings to be recited over the candles. From their debut in Berlin in the 1780s to their emergence in 1930s California, Jewish women’s salons served as welcoming havens where all classes and creeds could openly debate art, music, literature, and politics. This fascinating book is the first to explore the history of these salons where remarkable women of intellect resolved that neither gender nor religion would impede their ability to bring about social change. Emily D. Bilski and Emily Braun examine the lives of more than a dozen Jewish salonières, charting the evolution of the salon over time and among cultures, in cities including Berlin, Vienna, Paris, London, New York, and Milan. They show how each woman uniquely adapted the salon to suit her own interests while maintaining the salon’s key characteristics of basic informality and a diversity of guests. Other distinguished contributors to the volume discuss in detail the Berlin salons of the 1800s; the salon in terms of Jewish acculturation and its relation to gender and music; and the relations of Marcel Proust, Oscar Wilde, and Gertrude Stein to the literary salon. The book is enriched with a lavish array of illustrations, including documentary photographs, paintings, drawings, prints, and decorative arts. 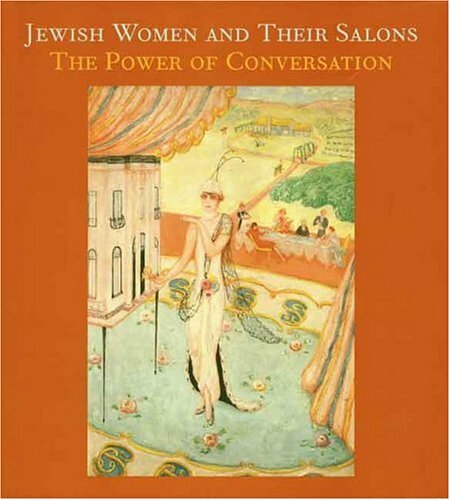 The book on the Salons was part of the Jewish Museum (NYC) show last spring. I saw the show and the book is now a tool I use for research. The women and their salons include some of the most influental and creative forces through the centuries. The book is also worth having as table top book, for your salon/living room as a way to stimulate converstions when your friends gather. Biliski is to be commended for her work on a topic Jewish Women have been waiting for. For the earlier part of this analysis, I would like to retitle the book 'Salons'. By provisionally eliminating the 'Jewish' or 'female' associations in the book, the study of the 'salon' as a cultural entity is unique itself. Then coupled with the 'female' as the main creator and motivator of the salon is surely mind-expanding. Then, in addition, (to those interested) to add the Jewish aspect (which, again, if one is interested) with its many associations (Jew and still German or Austro-Hungarian; the 'Court Jew'; voluntary conversion (or 'slipping away, or intermarriage) of some Jews, and its association with anti-Semitism, or just the desire to be 'less Jewish', the prominent place of many Jews in European history, etc., etc.) is surely a plus. Now, to the physical aspect of the book: Its binding, quality of the paper, and quality of the (many colored) reproductions, are first quality. Its content is unequaled with its seven introductory articles by the editors, the four monographs by other authorities; then the most interesting biographies of the female 'salon-keepers' [!!! ]; and finally the fine notes, biblography and index. 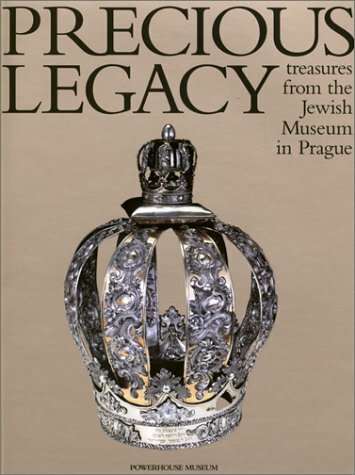 To recapitulate: Physically this is a fine production; the subject (the salon) is a real contribution; plus the important function of the female (I can't think of any male 'salonniere'), and, to those interested, the importance of the Jew in the cultural history of particularly Germany and the Austro-Hungarian Empire, this a unique and entirely 'satisfying' production. 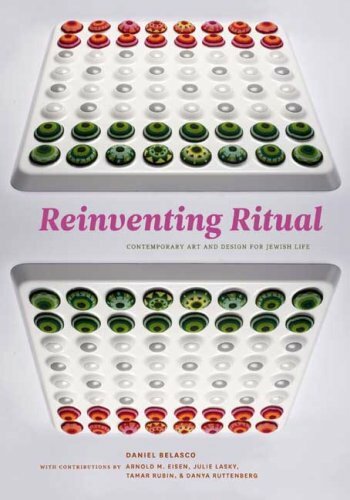 A guidebook to the most current trends in contemporary Jewish art and design, Reinventing Ritual provides an unprecedented look at the work and thought of contemporary artists as they respond to the needs and practices of traditional culture. 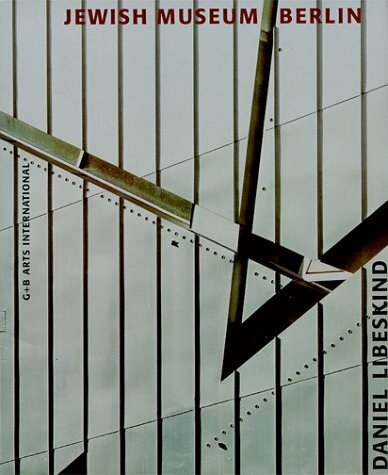 Beautifully illustrated with new art from Israel, Europe, and the Americas, this publication features both traditional and avant-garde sculpture, textiles, architecture, metalwork, and ceramics by forty leading artists. Author Daniel Belasco surveys current trends in Jewish ritual art and the influences of feminism, environmentalism, multiculturalism, and new media; Julie Lasky provides a groundbreaking discussion of the role of recycling and social consciousness in contemporary Jewish design; Danya Ruttenberg, a recently ordained rabbi, offers a lively perspective on the constantly evolving Jewish impulse "to concretize the encounter with the Divine"; Arnold M. Eisen writes an absorbing and personal commentary on the role of ritual in Jewish life today; and Tamar Rubin contributes an illustrated timeline covering key Jewish cultural and historical events from 1994 to 2008.